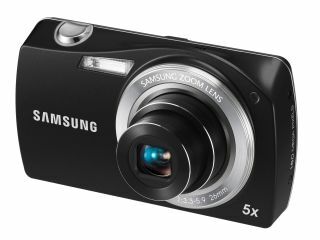 Samsung has announced a bunch of new point-and-shoot compact cameras heading to the UK over the next few months. First up is the ergonomically designed ST6500, the body of which is curved around the angled lens for maximum hold comfort. It also boasts a 16-megapixel sensor, 26mm wide-angle lens, 5x zoom, a 3-inch LCD touchscreen and a range of smart-features to automatically adjust settings based on your shot. The ST6500 comes in black, silver and red to "meet all style requirements and individual tastes" as long as you like black, silver or red. UK pricing for the ST6500 is set at £199.99, with a UK release date in March. The Samsung ST95, ST90 and ST65 are all very similar beasts. Their wide angle lenses range from 26mm to 27mm, with a 16-megapixel sensor on the ST95 and 14-megapixels on the ST90 and ST65. All three offer video recording and "fashion leading colours" – silver, indigo blue, pink, purple and orange. Fashion leading indeed. All three cameras have a UK release date in February, priced from £129.99 to £179.99. Finally the ultra-portable ST30 which is the baby of the lot, around the size of an average mobile phone - which Samsung reckons is around 82 x 51.9 x 16.9 mm these days. With face detection, autofocus, a 28mm lens and 3x optical zoom, shots should be none-too-shabby, and digital image stabilisation is included for the shaky-handed among us. You'll be able to choose from silver, black, lilac, pink and lime "to match your mood", as long as you intend to stay in the same mood for the foreseeable future. The ST30's UK release date is slated for March, priced at around £89.99.